Good news for those living between DMCC and Ibn Battuta! No more using the alternative free shuttle bus! At last, the new Metro tracks between the two metro stations are ready to reopen on Friday April 19. New trains have already arrived to carry on trials later this year. 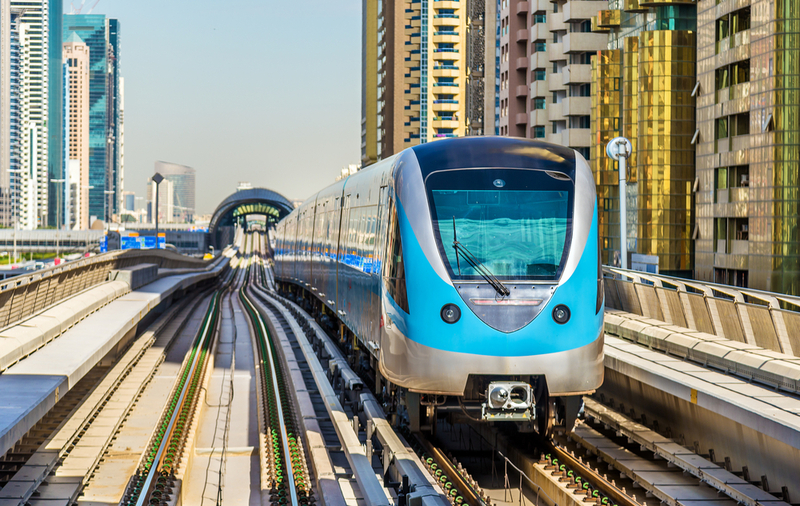 Dubai Metro riders can now commute seamlessly without any interruption between Dubai Multi Commodities Centre Station and Ibn Battuta Station on the Red Line. 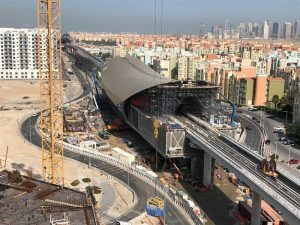 DMCC (JLT) -Ibn-Battuta Metro route to Open. FS1 Free Bus shuttle service to be stopped on 19th April. Signage outside DMCC (JLT) metro station. 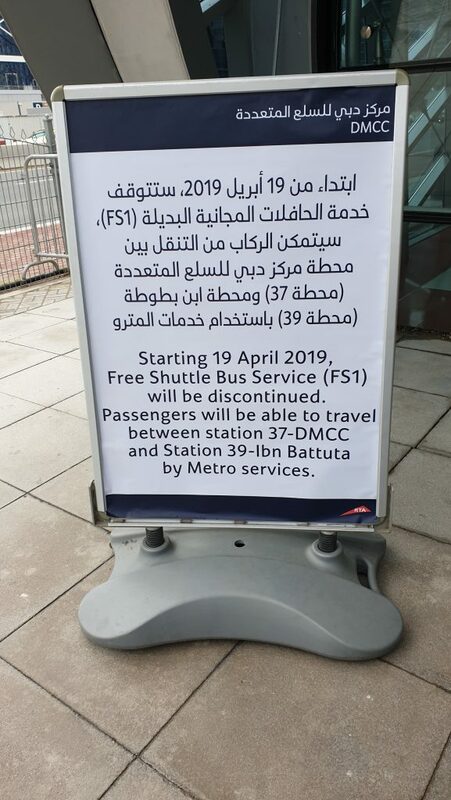 The metro route between DMCC station and Ibn Battuta was taken off schedule on January, last year due to the Route 2020 scheme that included a new metro station being built to create travel links to the Expo 2020 site. Accordingly, the Nakheel Harbour and Tower station and the attached multi-level parking terminal had also been fully closed. Since the Metro stations were closed, RTA provided free shuttle buses between the two stations to ensure the smooth mobility of riders and not inconveniencing them with construction works underway between the two stations. 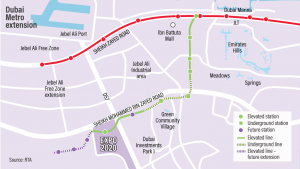 The 15km-long Route 2020 is an extension of the Dubai Metro’s Red Line that connects Nakheel Harbour and Towers station with the Expo 2020 site. It runs on an 11.8 km elevated track and 3.2 km underground. Route 2020 is supported by seven metro stations, including an interchange station, a station at the expo site, three elevated stations and two underground stations. While construction of the Route 2020 began in 2016, it is expected to complete by this year end. But now RTA has given the green light for the section of line to open again on Friday, April 19. Dubai Metro riders can now commute seamlessly without any interruption between Dubai Multi Commodities Centre Station (DMCC) and Ibn Battuta. However, Nakheel Harbour and Tower station lying between Ibn Battuta and DMCC stations and the attached multi-storey car park will remain closed while the network extension continues.